Women Artists on Parts Unknown'? Good food and art-by-women conversation in Florence, with 'Anthony Bourdain: Parts Unknown'. Home >> News >> Highlights >> Women Artists on Parts Unknown'? AWA Advocates dine with Anthony Bourdain and Asia Argento. "Eat. Drink. Know. Go." is the mantra of this cutting-edge food-inspired travel series, broadcast on CNN to 80 million viewers worldwide. 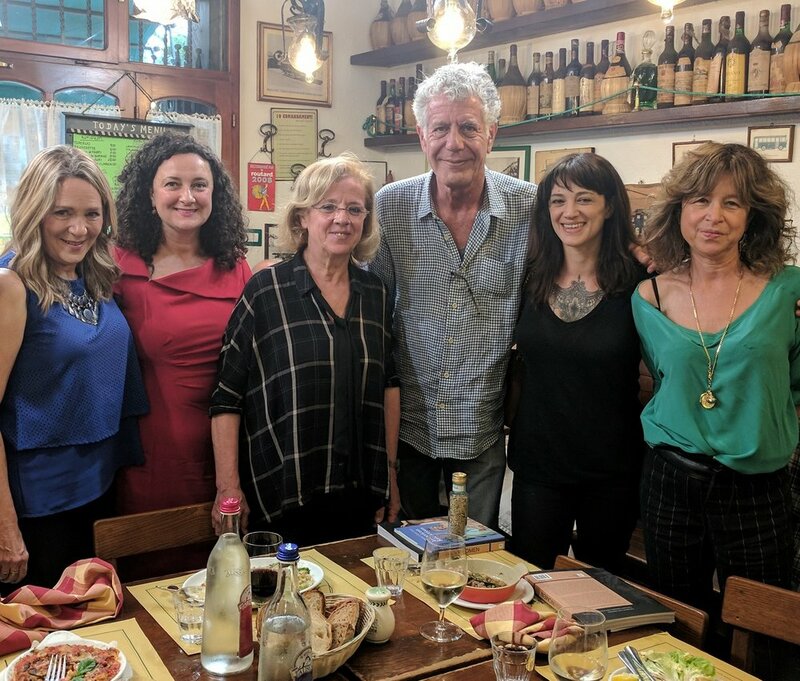 What an honor for host Anthony Bourdain and Italian actress Asia Argento to invite AWA and its Advocates for dinner to discuss the under-recognized art by women awaiting rediscovery. The Florence episode, directed by Morgan Fallon, is scheduled for completion next fall (2018), in the meantime, follow the lead: good food and art conversation centered around the question: 'Where are the women and how can their art legacy be fully reclaimed?' Who were the women involved? AWA Advocates around the table: Conservators Rossella Lari and Elizabeth Wicks, AWA Director Linda Falcone, Florence museum curator Cristina Gnoni and outreach coordinator Paola Vojnovic. Because the show features the world's best food, we took them to Florence's Il Tramvai to celebrate the season of fried zucchini flowers!